While Australia’s PM was embroiled in controversy, his foreign minister was visiting Afghanistan. 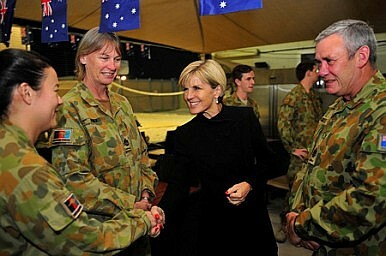 While Tony Abbott was making world headlines for another screaming misstep, his foreign minister Julie Bishop was in Afghanistan renewing Australia’s commitment there on a surprise Australia Day visit. Last year Australia began again to worry about its domestic security after a large anti-terror raid (which led to one conviction) in September in Sydney that seemed a fine piece of security theater, reports of many Australians travelling to Syria to join the Islamic State – including one man who brought his young sons – and a hostage situation in Sydney that left three, including the gunman, dead. However, Australia’s anti-terror work also has a global bent. Bishop told troops, “We’re in an epic battle. We are facing threats from non-state actors who have no regard for boundaries or for laws, no respect for civilized behavior or humanity, whether it’s the Taliban … or Daesh.” There is a worry, she said, that elements of ISIS (which Bishop tends to refer to as Daesh) would team up with Taliban still within Afghanistan. A second Iraq is a worry for both the U.S. and its allies, such as Australia. Tony Abbott has been particularly strident in his desire to combat what he tends to call “an apocalyptic death cult” and has since the group began its huge push into Iraq been very enthusiastic about sending troops in if necessary; the Royal Australian Air Force has been delivering food to civilians in Iraq and has been undertaking airstrikes, as well as sending weapons to Iraqis fighting the group. After Afghanistan, Bishop flew on to the UAE to meet her counterpart H.H. Sheikh Abdullah bin Zayed Al Nahyan. This leg of her trip did not garner as much attention, although within a backslapping commentary on their ongoing friendship and increasing ties was a commitment on both sides to work together on “countering extremism and violence,” according to the Emirates News Agency.